We have an on-going effort to increase the health and diversity of the many habitats in the Bolsa Chica Ecological Reserve. Planting Native plants increases the viability, health, and diversity of these rare habitats while promoting natural propagation and habitat growth. Native plants increase the population and health of native species including some endangered and threatened birds, insects and mammals. The Conservancy has (6) grow boxes where we propagate native plants from seed, cutting, and plugs. Depending on the season, we use these boxes to plant seeds into seed flats, help cuttings grow roots and house native plants ready to go into the ground while providing them space where they are protected from the elements and rabbits and gophers. Growing native plants from seed, cutting, or plugs is cost effective and also a great volunteer activity. Groups can literally care for native plants throughout their lives here at the Bolsa Chica Conservancy. What makes a plant invasive? An invasive species, also known as an exotic or nuisance species, is one that is introduced into a new environment, where it is not native. Plants are considered invasive when they have spread through unnatural means. These plants are brought in from geographically divided regions of the world deliberately, for ornamental purposes or erosion control and accidentally, by hitchhiking seeds attaching themselves to clothes, shoes, baggage, and many others. Prevention and early detection of invasive plant species is essential in the fight to control their rate of distribution. 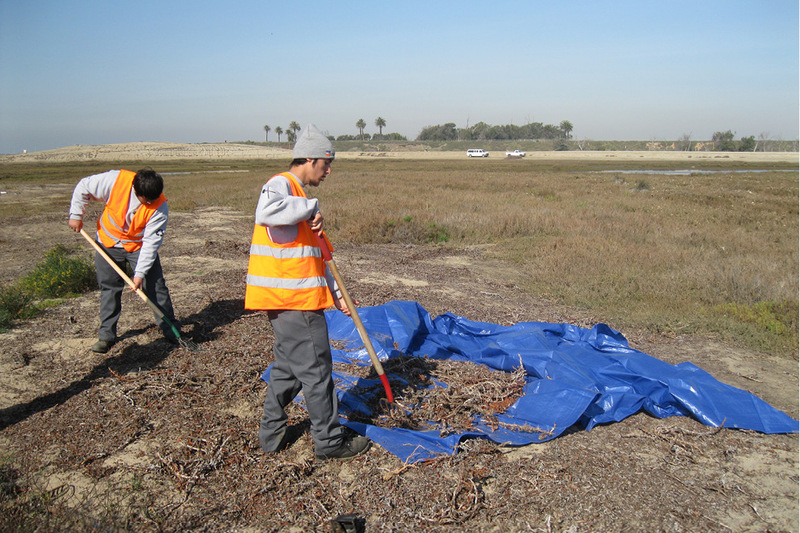 The Bolsa Chica Conservancy’s staff and volunteers have been using various non-intrusive techniques such as hand-pulling, non-chemical techniques such as covering plant material with plastic sheeting, and salt-water irrigation to manage the reserve’s most invasive species. The Bolsa Chica Conservancy’s efforts target 10 high-priority invasive plants: Iceplant (Carpobrotus sp. ), Arundo (Arundo donax), Russian Thistle (Salsola sp. ), Sea Rocket (Cakile maritima), Wild Radish (Raphanus sativus), Brazilian Pepper Tree (Schinus terebinthifolius), Tree Tobacco (Nicotiana glauca), Sand Plantain (Plantago indica), Fennel (Foeniculum vulgare) and Pampasgrass (Cortaderia sp.). 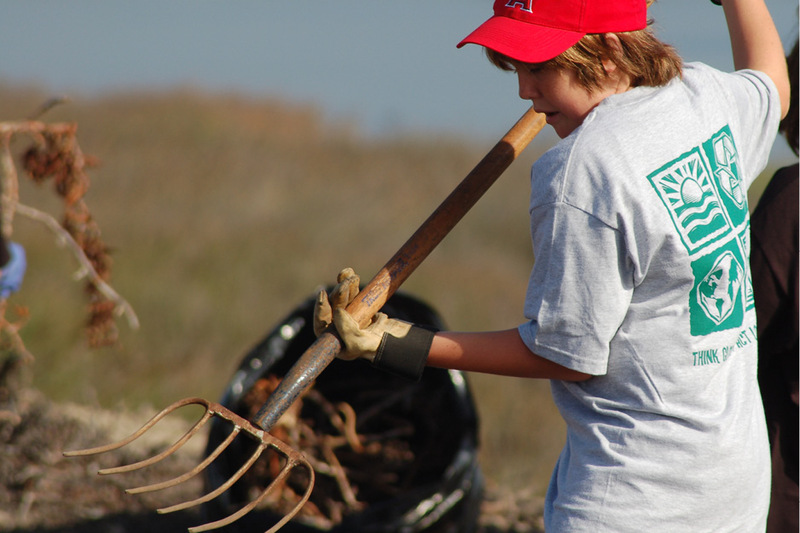 Since its inception in 1990, the Conservancy’s staff and dedicated volunteers have actively removed non-native plants from over 900 acres of land in the Bolsa Chica Ecological Reserve. A significant amount of effort was placed in around populations of endangered Coast Woolly-head (Nemacaulis denudata var. denudata) and Southern Tarplant (Centromadia parryi ssp. australis), both of which are included in the CNPS Inventory of Rare and Endangered Plants. These small and geographically divided populations have been successfully mapped by the BCC staff, using GPS (Global Positioning System) and GIS (Geographic Information Systems) technology, and are being monitored on a continuous basis. Included in the past years efforts is the land which makes up Nest Site 1 (located at the east end of the walking bridge, off of the reserve’s southern parking lot), invasives have prevented the nesting success of the threatened Western Snowy Plover (Charadrius alexandrinus nivosus) and endangered California Least Tern (Sterna antillarum browni). Prevent the spreading and forming of new populations through early detection, use of weed-free soils and propagating and installing locally collected seed and plants. Eradicate existing populations to minimize the negative effects on the natural and cultural resources and scenic values. Restore native species and habitats in areas degraded by large populations of invasive plants through native plant planting and seeding. Make sure all removal, restoration and monitoring techniques are environmentally friendly and justified by scientific research. Use all areas, including those identified for restoration and already restored, in the educational regime when training new volunteers and teaching the general public about natural resource management. Affecting the Native Wildlife: Non-native plants, to which native animals are not adapted to feed upon, can quickly smother an area to such an extent where their natural food sources are no longer available. Some species of animals are extremely specific to which plants they not only feed on but live within and have become threatened or endangered due to the loss of that native plant. Changing the Visitor Experience and Understanding: Invasive plants can convert brilliant displays of blooming wildflowers into large, unpleasant monocultures. Barbs on invasives, such as the yellow starthistle (Centaurea solstitialis), can transform inviting and accessible areas into impenetrable and ugly grove of thorns. Spreading Beyond the Wetlands: Invasive species are not constrained by political borders. Due to the prevailing west winds, visitors to the wetlands and wildlife, invasive plant seeds can spread rapidly to bordering lands. Physical Removal - includes hand-pulling and the use of simple gardening tools. Benefits: Selective and controlled with minimal disruption to the soil structure. Disadvantages: Labor intensive, requires repeated treatments,appropriate timing in the plants life-cycle, and proper plant identification. Solarization - a simple non-chemical approach that traps radian heat energy from the sun by covering invasive plant material over a period of time, has been used to kill, wilt and eradicate plant material, root rot fungi, bacteria and other noxious seeds and plant material. Benefits: Takes little time or effort to install and can be used in combination with other methods. Disadvantages: Is only fully effective in the summer and if improperly installed the plastic sheet may tear and blow away. 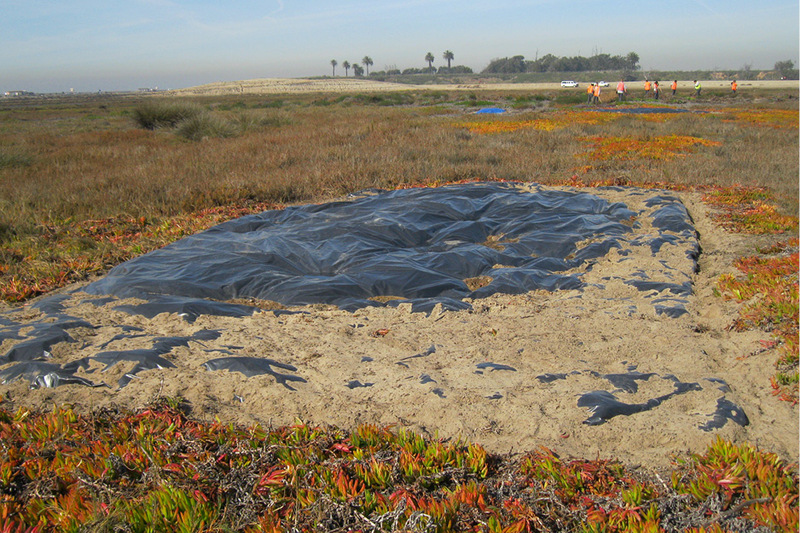 The Bolsa Chica Conservancy employs these restoration techniques in a variety of different habitats in the Ecological Reserve. Coastal Salt Marsh habitats are increasingly rare due to development over past centuries and increasingly fragile. Coastal Strand Dune habitats are even rarer and ever more fragile. The Conservancy also conducts habitat restoration in Upland Coastal Sage Scrub habitat and the occurring eco-tone habitats found in transition zones between these three habitats. CLICK HERE to learn more about wetland habitats at Bolsa Chica.